New research by scientists at the University of Georgia has shown, for the first time, that an African Grey parrot can develop a deeper understanding of the soundswhich we hear as wordsthan researchers previously thought. The findings were recently published in the Journal of Comparative Psychology. Other authors of the paper are Dorothy Fragaszy, professor of psychology, director of UGAs primate behavior laboratory and chair of the universitys behavioral and brain sciences program; and Michael Covington, associate director of UGAs Institute for Artificial Intelligence. 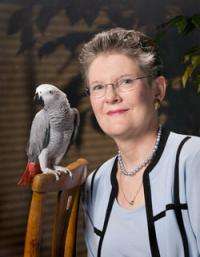 The team studied a companion-animal African Grey parrot named Cosmo, which lives with Betty Jean Craige, University Professor of comparative literature and director of the Willson Center for Humanities and Arts at UGA. To our knowledge, the current study is the first to investigate the effects of social context on parrots spontaneous vocalizations, said Fragaszy. In order to study how this works, the team videotaped Cosmo, a female, in four distinct social contexts. In the first context, Craige began recording Cosmo and left her house for the duration of the session. In the second, Craige sat in the room with Cosmo and interacted with her as normal. The third saw Craige in an adjacent room interacting with Cosmo normally by voice. Finally, the fourth context saw Craige and Colbert-White in the same room with Cosmo but reading to each other from online blog entries to simulate dialog and ignoring Cosmo (not interacting with her, making eye contact or any gesturing toward her). Cosmo is already well-known among parrot-lovers, both for her often hilarious You Tube recordings and as the subject of Craiges 2010 book "Conversations with Cosmo: At home with an African Grey Parrot." While the new information about Cosmos abilities helps stress the important role that socialization plays in learning to communicate, much more study remains, Covington said. We cant presume the parrots words mean what they would mean in English, he pointed out.They sound like human words, and theyre produced in situations where humans would say similar things, but we have to experiment to find out what they actually mean to the parrot. While the new research suggests that a primate or even mammalian brain may not be necessary for an individual to develop aspects of vocal communication competence, Craige has known since she bought the domestically hatched and raised bird from a pet store in 2002 that Cosmo had her own special qualities. Is the Internet lying to us? If these tiny creatures can learn to speak english well enough to be understood, I wonder what their own naturally occuring language consists of. I propose a study of captive African Greys who are raised among others of their kind and not influenced by our speech. I also suggest two studies, one study to breed them for talking, another study to breed them for handgrip and tool handling. Lets see what they will evolve into and what happens if you put those birds together in a far later stage. They could become better pets than a dog could have ever been to us. I propose we put a couple of humans in a cage and breed them for empathy. Good idea kaasinees. We need new, very simplified human language also. For parrots or future geneticaly modified or newly created smart animals.